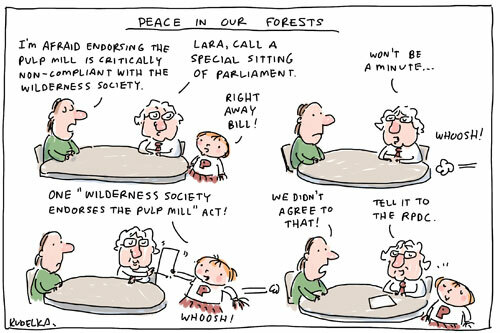 I’m not entirely sure what pulp mill everyone thought they were talking about up to this point, butÂ Tasmania’s forest, er, peace talks have peacefully segued from vague mentions of “a” nice, friendly, peaceful pulp mill to “the” pulp mill. Remember that one? Anyway it seems to boil down to “hand over the social licence or the trees get it”. Good luck with that, everybody. ← Where else but Queensland? â€œhand over the social licence or the trees get itâ€ – that’s the cartoon I’d like to see !